The 2018 edition of INVEST 2019 TRADERS & INVESTORS SUCCESS SUMMIT, a comprehensive stock trading and investing summit, organized by Investdata Consulting Ltd, will hold this Saturday, December 8, 2018 at the Ostra Hall & Hotels, opposite the NNPC Gas Plant, Alausa, Ikeja, Lagos. 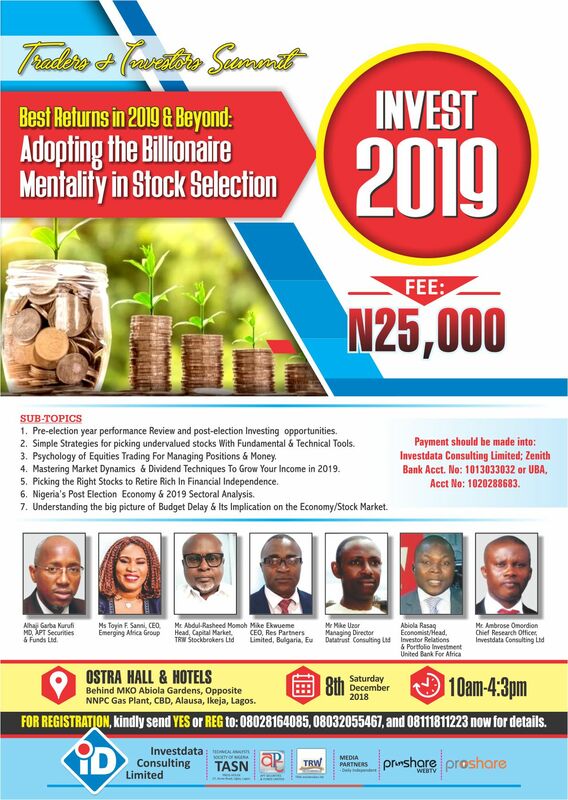 A team of stock market experts and professionals have been carefully assembled for the summit to help participants start their journey into financial success in 2019 and beyond, which begins at 9am, with the theme: Best Returns In 2019 & Beyond: Adopting the Billionaire Mentality In Stock Selection. While Mrs. Sanni, a lawyer and fellow of the Chartered Institute of Stockbrokers, will speak on Pre-election year performance Review and post-election Investing opportunities, discussing how, historically, the factors and policies that have influenced Nigeria’s stock market in an election year, implications for 2019 and how it would drive equity prices higher as recovery expectation continues; Alh. Kurfi, also a fellow of the CIS and Institute of Chartered Accountants of Nigeria (ICAN), will handle “Understanding the big picture of Budget Delays and Implications on the Economy/Stock Market,” focusing on the importance of government’s yearly budget and its role in economic growth; impact of budget delays and implications on the economy. Momoh, an Fellow of the CIS, Certified Technical Analyst and guru in short term trading techniques, will handle: Simple Strategies for picking undervalued stocks With Fundamental & Technical Tools dwelling on how to read price actions and chart patterns like the professionals, for a do-it-yourself approach to investing, as well as knowing when professional traders are entering and exiting the market;just as Mr. Omordion, a Fellow of the Institute of Professional Financial Managers, UK; Associate Member of the Certified Pension Institute of Nigeria, Certified Financial Manager, South Africa and UK-trained stock market analyst, technician and Convener of Traders & Investors Summit, will speak on Mastering Market Dynamics & Dividend Techniques For Income Growth in 2019, showing participants how to take advantage of seasons, patterns and cycles to invest profitably, besides showing participants how market cycles support market reactions to earnings; and how to use earnings calendar, trend, surprises and quality of numbers in making profitable investment decision in 2019 and beyond. Engr. Anaydibe, who has developed and applied econometric techniques to the Nigerian financial & secondary commodity markets and successfully created ‘timing & trend’ models of the Nigerian Stock Exchange, based on technical analysis of ‘Real Nigerian Investors’ Behavior & Sentiments, will look at Psychology of Equities Trading For Managing Positions & Money, teaching participants how to protect their gains when trading, early warning signs of when a trend is about to turn against you; knowing when it’s safe to stay in a trend or jump out, among others. Mr. Abiola will take participants on Nigeria’s Post Election Economy & 2019 Sectoral Analysis,giving expectations and outlook for the Economy in 2019 and impact of government policies on sectors in the post-election year to boost industry performance, economy and stock market, looking at the expected reforms that come with new dispensation. 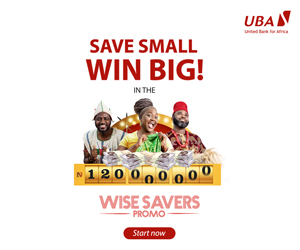 Also, he will look at sectors to watch going into 2019 and beyond; even as Mr. Uzor, who has traversed core areas of the financial market- banking, stock brokerage, pension, marketing communications and author of How to Buy & Sell Shares in Nigeria, a practical guide, will handle Picking the Right Stocks for Financial Independence and to Retire Rich, showing participants how to take advantage of seasons, patterns and cycles to plan for a successful retirement, knowing that some events occur once in two, four and seven years. Participants will also learn criteria for choosing right stocks for retirement in financial freedom; the sectors and how to maximize the opportunity of the current low prices to select right. Also, as benefits from the Summit, participants will get free Technical Analysis Navigators that combines timing & trend’ models for trading Nigerian Stocks, Forex, Derivative and Commodities. Facilitators will discuss Stocks to Watch and position ahead of Santa Claus and post-election rally, as well as learn the 10 Golden Stocks To Buy in 2019.